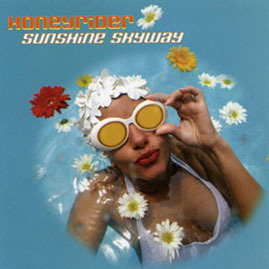 Fronted by Gary Strickland on lead vocals and guitar, Florida's Honeyrider are one of the more widely buzzed about bands in the indie underground. Their first two releases on legendary UK label Damaged Goods Records—All Systems Go! (1998) and Splashdown (2000)—are infectious pop gems that won the group praise in publications such as the NME and Rolling Stone. Like its predecessors, Sunshine Skyway is full of buzzin' Jesus and Mary Chain/Primitives guitar sounds, Beach Boys-styled melodies, and soulful psychedelic pop, but the songwriting here is even more potent, the lyrics displaying a personal side that Strickland has only hinted at previously.